Ahead of the unveiling of a large feature Public LED clock designed in a Central London location in the next couple of weeks, I started researching other historical public clocks and came across the piece about a theoretical "light clock" that has obvious disadvantages as described below. Waterwheel clocks that collect water in buckets marked with timescales.Candles with marks on them to show how long they have been burning. Sundials that project the Sun's shadow onto graduated clock faces.Clockwork clocks that gradually release the energy stored in wound springs. Clocks that measure the vibrational frequency of crystals such as quartz, or even atoms.Most clocks measure how many times a repetitive action is carried out. For example, in a digital watch, the quartz crystal usually vibrates at 32,768 times a second. These vibrations are counted by electronic circuits, and after 32,768 "ticks" have been counted a second is added to the watch's display. We can also use light to make a clock, at least in theory. To do this we need to bounce a pulse of light between two mirrors that are a known distance apart. Light travels at 186,300 miles per second (very close to 300,000 km per second), so if we separate the mirrors by a distance of 93,150 miles (i.e. half 186,300) each individual mirror will be struck by the pulse of light once a second. 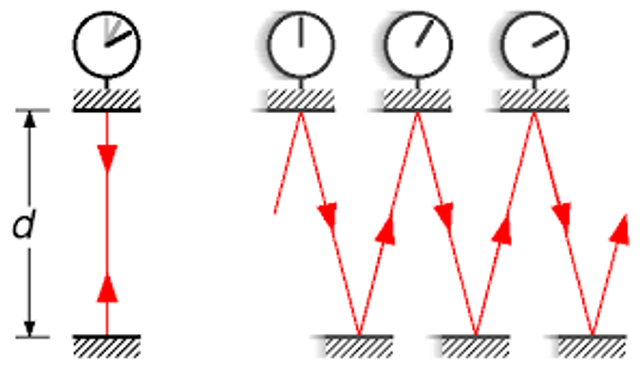 In other words, the round trip from one mirror to the other and back again will take the light pulse one second. We now have a clock: There are a number of practical problems with such a clock. Probably the most obvious one is the separation distance of the mirrors, but in reality, we could put them very close together and count faster "ticks". The large separation used here is just to demonstrate the principle and make the mathematics easier. In reality, the mirrors would absorb some of the light each time they were struck by the pulse and after a time the light pulse would dissipate completely. Also, the fact that we can see the light by all means, that at least some of it, is being scattered thereby further weakening the pulse. None of this really matters, however, because we are dealing with a theoretical proof and not an experimental one. The new Octant LED clock I am pleased to say is much more shallow than suggested above and instead of bouncing light between two mirrors uses state of the art LED technology and control system technology to create a beautiful timepiece.